Polarizers are still the one accessory filter that every photographer needs. In this episode of The Digital Story, I discuss how to pick the right polarizer, how to use it, and the pitfalls to avoid. In the show I refer to it as "buffet line" because I have lots of other goodies to cover too. I also discuss this month's photo assignment, Slender. You can read more about how to submit on our Submissions page. Deadline for entry is May 31. I loved your advice on polarizing filters, and also think that your sugestion for a future photo assignment is really cool & look forward to it! Also, I have been a dedicated listener to your podcast for what seems like forever, but i have a question: What does it take to be part of the "Vertuial Camera Club"?? I occacianly submit photos in Photo Assignmints and am starting to be alot more active in all of your great (for lack of better words) submittion things. Does this automaticly make me a member of the Vertial Camera Club, or must i explor further to feed my hunger for being active in podcasts?!? I ask this here and not in an e-mail to questions@thedigitalstory.com, because i feel that i am not the only one with this problom. If you could please contact me at my e-mail adress, of quickly mention it in the podcast, it would be great. I was going to ask this question via email, but I thought posting it here might make sense because other people might find your answer helpful. How do I use the polarizer filter with a DSLR? I used to to use the polarizer filter with my point-and-shoot: I just rotate the filter until the desire outcome is achieved on the LCD. With a DSLR (D200 in my case), there is no preview so how do I know when to stop rotating? First, you use a polarizer with a DSLR the same way you would with a compact camera. In fact, it's easier. Just mount the filter, look through the viewfinder, and rotate the filter ring until you get the desired effect. As for the virtual camera club, you're right, I should spend some time discussing this in a podcast. Essentially, though, you're a member just by signing up for the podcasts on iTunes, joining our Flicker public group, commenting on an weblog post, submitting a grab shot, or participating in a monthly photo assignment. Welcome aboard! Your iPod is just fine, Wayne :) I still dig the 17-40 f/4 zoom (alot actually). In fact it is now in my Rebel XTi kit serving me well. But the 16-35 f/2.8 II was just too sweet to pass up. So, I lined up a short series of photography classes to teach to cover the cost of the lens. It's now in my 5D kit. Very nice. Congratulations on your new 16-35L Mark II Derrick! Enjoy. Good timing with your latest podcast no. 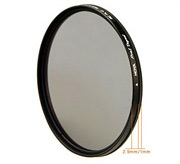 84 about polarizers and their cost, especially with this new lense's 82mm filter size. Wish I could sign up for one of those classes of yours but I live on the opposite coast from you. So let me know if there's going to be a video seminar available in the future, 'cause you're a great teacher. Thanks.